There is increasing evidence that exposure of volatile anesthetics to desiccated carbon dioxide absorbents may result in exothermic reactions leading to fires in anesthetic breathing circuits and production of toxic products (e.g., carbon monoxide, compound A, methanol, formaldehyde). Although fires have only been reported in association with sevoflurane exposed to desiccated Baralyme® (Allied Healthcare/Chemetron, withdrawn from the market), there is significant evidence that potentially toxic products can be produced upon exposure of volatile anesthetics to other desiccated absorbents containing strong bases, particularly potassium and sodium hydroxide. In some cases this may lead to sub-clinical carbon monoxide exposure. 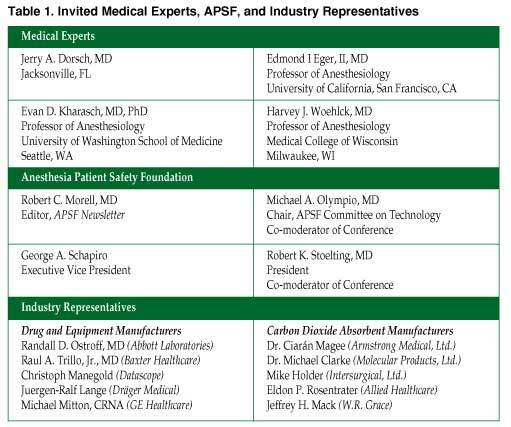 In view of these continued anesthesia patient safety concerns, the Anesthesia Patient Safety Foundation invited medical experts and industry representatives (manufacturers of carbon dioxide absorbents, anesthesia machines, and volatile anesthetics) to attend a conference entitled Carbon Dioxide Absorbent Desiccation: APSF Conference on Safety Considerations on April 27, 2005, in Chicago, IL. 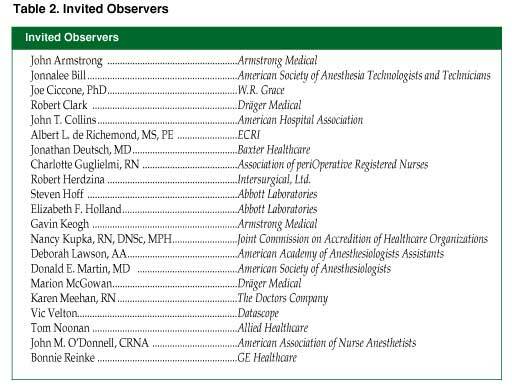 In addition to medical experts and industry representatives (Table 1), APSF invited several organizations, including the American Society of Anesthesiologists and the American Association of Nurse Anesthetists to send observers to the conference (Table 2). The conference was funded by the Anesthesia Patient Safety Foundation with the support of unrestricted educational grants from the 10 industry cosponsors. The retrograde flow of fresh gas through the absorber can desiccate the absorbent. This may be affected by a number of factors, including the design of the anesthesia breathing system, the presence or absence of the reservoir bag, whether the APL valve is open or closed, the relative resistance through the components of the breathing circuit, the fresh gas flow rate, I:E ratio, use of heat and moisture exchangers, and scavenger suction. With conventional breathing system design, removing the bag, opening the APL valve, and occluding the Y-piece all enhance retrograde flow and desiccation. The effects of these maneuvers in newer, more modern machines are variable, complex, and may have the opposite effect. Furthermore, we do not know of published data that describe the flow of gas under these various conditions. Unfortunately, the flow of gas in these breathing systems has not been well studied. The chemical breakdown to compound A can occur in moist, as well as desiccated absorbent, but the potential for highly exothermic reactions and fires with sevoflurane (liberating carbon monoxide, formaldehyde, and methanol) only occurs in desiccated absorbent and is enhanced by the type and quantity of strong base (KOH>NaOH). The renal effects of compound A formation under low flow sevoflurane anesthesia have been extensively evaluated in surgical patients and found to have no clinically significant adverse effects. The breakdown of desflurane, enflurane, and isoflurane (in descending order of magnitude) to carbon monoxide, requires desiccated absorbent and is also enhanced by strong base, and particularly Baralyme®. Baralyme® and Drägersorb® 800 produce more carbon monoxide than Drägersorb® 800 Plus (Dräger Medical, Inc.), Intersorb® and Spherasorb® (Intersurgical Ltd.), in descending order and with descending amounts of strong base. Clinical effects of carbon monoxide exposure have been described, but they may be concealed by post-anesthetic effects and cannot be detected by pulse oximetry. Fires have been reported in the USA with sevoflurane only and desiccated Baralyme®. However, cases of extreme heat associated with desiccated sodalime have also been reported in Europe. Dr. Kharasch strongly advocated the conversion to, and use of only carbon dioxide absorbents that do not contain strong base. The production of carbon monoxide is greater with desiccated KOH absorbents than with desiccated NaOH absorbents, and is proportional to base concentration. By-products of sevoflurane include carbon monoxide, formaldehyde, methanol, methyl formate, dimethoxymethane, and perhaps hydrogen gas at high temperatures. [The relative ability of these by-products versus other combustible materials, such as plastics or gaskets, to serve as a fuel in a high heat oxygen-enriched environment is not known.] Desiccation of traditional absorbent and its production of carbon monoxide cannot be detected with routine anesthetic monitors. The blue-violet discoloration of traditional absorbents typically indicates exhaustion, and not desiccation. Rapid discoloration might also indicate degradation of the anesthetic agent. One absorbent (Amsorb® Plus, Armstrong Medical) does change color with desiccation, as desiccation is expected to occur with absorbent exhaustion. Diagnosing carbon monoxide toxicity is difficult with its indiscriminate and non-diagnostic symptoms of confusion, nausea, dyspnea, headaches, and dizziness that might also be symptoms of anesthetic emergence. Studies show that total cessation of carbon monoxide production cannot be achieved despite implementation of anti-desiccation strategies. Monitoring of carbon monoxide gas in the circuit is currently possible with more sophisticated and more expensive detectors, and carboxyhemoglobin monitoring is available through co-oximetry, but is not routinely assessed. Indirect methods require particular gas analyzers that can detect trifluoromethane, an intermediate byproduct of isoflurane and desflurane. Volatile agents are not known to react with, or to produce compound A or carbon monoxide from Ca(OH)2, LiOH, or Ba(OH)2; however, theoretical chemistry provides for the potential reactivity of Ba(OH)2. The production of compound A and carbon monoxide arises from the action of the strong bases KOH and NaOH [and perhaps Ba(OH)2] on potent inhaled anesthetics. Compound A (implicated as a potential nephrotoxin) is produced in moist or desiccated absorbents with sevoflurane only. Carbon monoxide is only produced with desiccated absorbents, most with Baralyme® acting upon desflurane. Fires are known to occur only in the combination of sevoflurane and desiccated Baralyme®. Desiccated absorbents without KOH or Ba(OH)2, and with lesser amounts of NaOH, produce less heat and no fires, and dramatically less carbon monoxide or compound A. There is general recognition that all untoward events are rare and preventable at modest cost. Dr. Eger further stated that the production of toxic products can be eliminated through the use of absorbents containing only Ca(OH)2 with catalysts such as CaCl2 or CaSO4. Industry representatives provided summary information on foundational topics. They appreciated the significance of a conference that would bring together a core group of professionals who could clarify the issues and make recommendations to clinicians, manufacturers, and regulatory or insurance agencies alike. They agreed that clinicians need simple and straightforward consensus advice on how to promote patient safety. 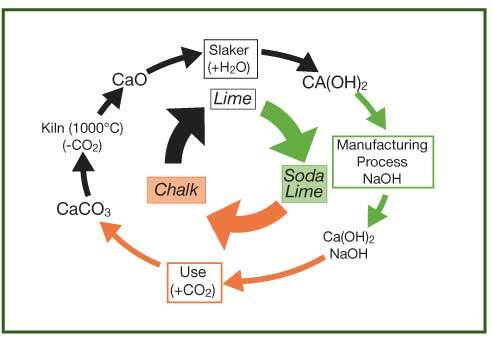 The chemical cycle of soda lime production, absorption of carbon dioxide, and regeneration of chalk was reviewed (see Figure 1). Chalk (calcium carbonate or CaCO3) is converted to lime (calcium oxide or CaO), while slaking with water converts lime to slaked lime (calcium hydroxide or Ca(OH)2). Gaseous carbon dioxide (in solution with water) reacts slowly with Ca(OH)2. Therefore, “soda” lime was created with the addition of the catalyst sodium hydroxide. This hydroxyl ion (OH–) reacts with carbon dioxide producing bicarbonate (HCO3–), which then has strong affinity for Ca(OH)2, recreating chalk and regenerating the hydroxyl (OH–) catalyst. Other formulations of absorbent do not rely upon strong base to catalyze the reaction, but instead are using substances such as CaCl2 or CaSO4. Numerous brands and formulations of absorbent are listed in Table 3. All contain a high concentration of Ca(OH)2. Discrepancies regarding their content exist in the literature. For example, legacy formulations of Sodasorb® (W. R. Grace and Company) had KOH, with NaOH below 4%. Current formulations have no KOH and the NaOH concentration is 3.7%. Sodalime variations also exist. Absorbent manufacturers have already developed products that produce insignificant or no compound A or carbon monoxide, whether moist or desiccated. They also produce minimal heat and minimally adsorb volatile agents. One absorbent provides a graded and permanent colorimetric indicator of both expected desiccation and exhaustion (Amsorb® Plus, Armstrong Medical Ltd.), while another (Spherasorb®, Intersurgical Ltd.) contains a substance that delays the total desiccation of the absorbent. Reducing by-products to negligible levels does not require strong-base-free absorbents. The incidence of patient exposure to carbon monoxide is unknown. ECRI, Abbott Laboratories, and other investigators have already published recommendations to minimize the risk of unintended desiccation of absorbents. Anesthesia machine manufacturers are aware that fresh gas flow through modern and unique breathing circuits may promote desiccation of absorbent in different ways. Clinicians are directed to those resources for detailed information. Monitoring absorbent temperature is one potentially useful adjunct, but the critical location of the probe and the quantity of heat that is worrisome have not been clearly identified. Temperature is elevated during normal carbon dioxide absorption reactions, and varies widely throughout the absorbent. Furthermore, carbon monoxide can still be produced at temperatures that might otherwise be associated with normal absorption. Relative humidity of the gas flowing out of the absorbent may be directly related to, and therefore indicate, its moisture content. Simple (home) devices to measure carbon monoxide are disrupted in the presence of volatile agents, but more sophisticated monitors are available. Some desiccated absorbents will continue to absorb carbon dioxide; therefore, the presence of an acceptable capnographic waveform should not be taken as confirmation that the breathing gas is free from carbon monoxide. Alternatively, an elevated baseline of inspired carbon dioxide on the capnogram should alert the clinician to the possibility of desiccation and/or exhaustion. 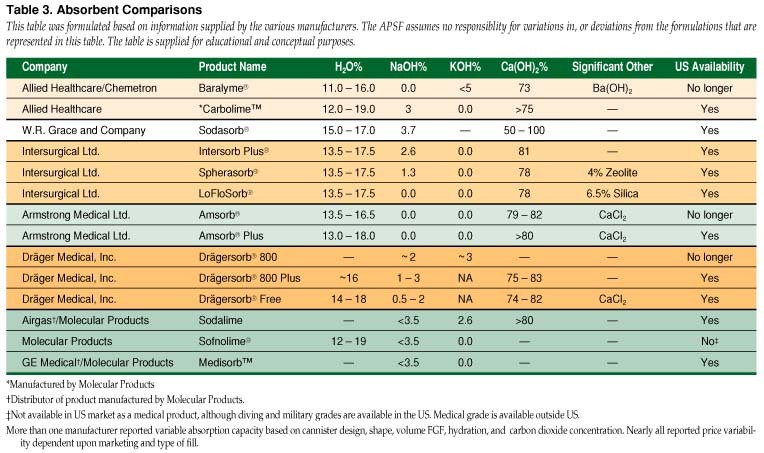 The APSF further recommends that there should be institutional, hospital, and/or departmental policies regarding steps to prevent desiccation of the carbon dioxide absorbent should they choose conventional carbon dioxide absorbents that may degrade volatile anesthetics when absorbent desiccation occurs. Turn off all gas flow when the machine is not in use. Change the absorbent regularly, on Monday morning for instance. Change absorbent whenever the color change indicates exhaustion. Change all absorbent, not just 1 canister in a 2-canister system. Change absorbent when uncertain of the state of hydration, such as if the fresh gas flow has been left on for an extensive or indeterminate time period. If compact canisters are used, consider changing them more frequently. There was also support for the APSF to create an “Expert Task Force” to define further the characteristics of carbon dioxide absorbents that do not significantly degrade volatile anesthetics. Dr. Olympio is Professor of Anesthesiology, former Director and Founder of the Patient Simulation Laboratory, and former Vice Chair for Education for the Department of Anesthesiology at Wake Forest University School of Medicine in Winston-Salem, NC. He is also Chair of the APSF Committee on Technology and serves on the APSF Executive Board as well. Holak EJ, Mei DA, Dunning MB III, et al. Carbon monoxide production from sevoflurane breakdown: modeling of exposures under clinical conditions. Anesth Analg 2003;96:757-64. Olympio MA, Morell RC. Canister fires become a hot safety concern. APSF Newsletter 2003-04;18:45, 47-8. Fatheree RS, Leighton BL. Acute respiratory distress syndrome after an exothermic Baralyme-sevoflurane reaction. Anesthesiology 2004;101:531-3. Wu J, Previte JP, Adler E, et al. Spontaneous ignition, explosion, and fire with sevoflurane and barium hydroxide lime. Anesthesiology 2004;101:534-7. Castro BA, Freedman LA, Craig WL, Lynch C III. Explosion within an anesthesia machine: Baralyme, high fresh gas flows and sevoflurane concentration. Anesthesiology 2004;101:537-9. Woehlck HJ. Sleeping with uncertainty: anesthetics and desiccated absorbent. Anesthesiology 2004;101:276-8. Knolle E, Heinze G, Gilly H. Small carbon monoxide formation in absorbents does not correlate with small carbon dioxide absorption. Anesth Analg 2002;95:650-5. Woehick HJ, Dunning M III, Nithipatikom K, et al. Mass spectrometry provides warning of carbon monoxide exposure via trifluoromethane. Anesthesiology 1996;84:1489-93. Anesthesia carbon dioxide absorber fires. Health Devices 2003;32:436-40. Hazard update: revised recommendation for “Anesthesia carbon dioxide absorber fires” (published November 2003). Health Devices 2003;32:487. Editor’s Note: There is not uniform agreement among experts as to the specific types and amounts of degradation products that may form when volatile anesthetics are exposed to desiccated absorbents that contain significant amounts of KOH and NaOH. Hence, no specific conclusions can be drawn from this conference about the relative contribution of any specific degradation product or circuit material [including plastics] as a combustible fuel in a high heat, oxygen-enriched environment. Representatives from Absorbent Manufacturing join with APSF to explore safety considerations of absorbent dessication on April 27th, 2005 in Chicago, IL. 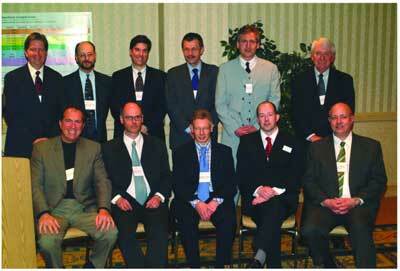 Participants are (top row, left to right) Jeffrey Mack; Randall Ostroff, MD; Jonathan Deutsche, MD; Juergen-Ralf Lange; Christoph Manegold; Robert Stoelting, MD (APSF President); (bottom row, left to right) Michael Olympio, MD; Mike Holder; Dr. Michael Clarke; Dr. Ciarán Magee; Michael Mitton, CRNA. 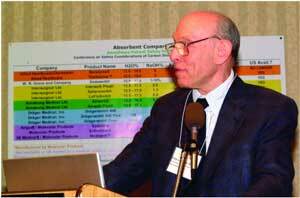 Dr. Edmond I Eger, II, MD, addresses participants at Absorbent Conference.